Can Royal Gold, Inc. Weather a Market Downturn? If the stock market goes down, Royal Gold's precious-metals focus will be a benefit. But what if gold prices go down? No big deal, either. Royal Gold, Inc. (NASDAQ:RGLD) operates in the precious-metals industry, but it isn't your typical gold and silver miner. Royal Gold is a streaming and royalty company, which changes the equation quite a bit. For example, if there's a broad market downturn, gold prices are likely to go up because of gold's role as an alternative asset and store of wealth. But what if commodities hit the skids again? Well, that's an opportunity, too. Here's why. Royal Gold is one of the larger precious-metals streaming companies. That means it gives money up front to miners in return for the right to buy gold and silver, among other things, in the future at reduced rates. For example, Royal Gold has a deal with Barrick Gold (NYSE:GOLD) in which it pays 30% of the spot price for gold and silver from the Pueblo Viejo mine in the Dominican Republic up to certain production levels, and then 60% of the spot price thereafter. You can see why Royal Gold would want to lock in low prices, but why would Barrick Gold ink that agreement? At the time of the deal, in 2015, miners like Barrick were under financial strain and looking for cash to solidify their balance sheets. The upfront payment of $610 million was a big help to Barrick's balance sheet. But there are other reasons for setting up streaming agreements, too, such as monetizing byproducts that aren't a main corporate focus (think of a copper-focused miner that also pulls up precious metals) or to help fund development projects when other financing options are less desirable. It really is a mutually beneficial arrangement. What happens to Royal Gold if the market goes down? So while Royal Gold doesn't mine for precious metals, it is a precious-metals company. And that means its top and bottom lines are largely determined by the price of silver and gold, though it does have exposure to some other commodities, mostly copper. Both gold and silver are considered stores of wealth. In a market downturn, investors often turn to silver and gold as safe havens, boosting their prices. 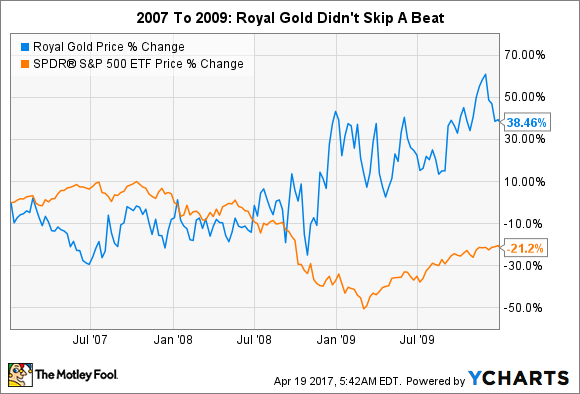 But not all investors want to own gold directly, instead opting for precious-metals stocks -- which helps explain why Royal Gold kept moving higher between 2007 and 2009, when the S&P 500 Index was falling. In case you don't remember, that was a time period that included the last recession in addition to the major market downturn. If there's a market correction, I'd expect Royal Gold to hold up pretty well. But what about a reversal in the price of gold and silver? What happens to Royal Gold if precious metals go down? Now here's the interesting thing about Royal Gold's streaming business model. When Barrick was struggling, Royal Gold came in and provided it with cash. In fact, deals like this one made during the commodity downturn allowed Royal Gold to increase its volume by 13% in fiscal 2015 and a massive 36% in fiscal 2016. In other words, a precious-metals downturn is an opportunity for Royal Gold to grow its business. To be fair, if gold and silver prices fall, Royal Gold's top and bottom lines will fall, too. So a commodity downturn would probably lead investors to sell the stock. But that would probably be a mistake, since the company has proved it can strengthen its business when miners are struggling. And there's a good reason to stick around -- dividends. Royal Gold has increased its dividend for 16 consecutive years, even though gold prices are still much lower today than they were in 2012. That income stream can help you tough it out while Royal Gold looks for the next big deal in a precious-metals downturn -- which will make it a better company when the next upturn comes around. So because of its precious-metals focus, Royal Gold will probably hold up, if not go up, during the next market downturn. But it will also have the opportunity to create value for shareholders during the next commodity downturn, by inking streaming deals at an advantageous time. Add in the dividend yield of around 1.3%, backed by a steadily growing disbursement, and there's a lot to like here -- even if Royal Gold is faced with a broad market or precious metals-specific downturn.